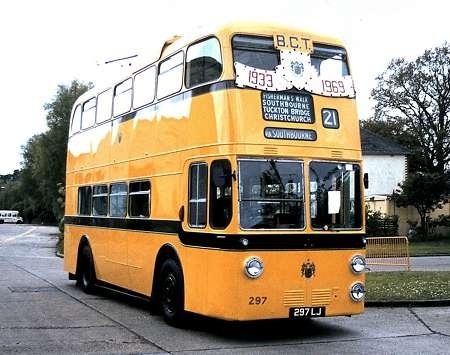 NLJ 272 is a Leyland Royal Tiger PSU1/13 with Burlingham B42F body, new to Bournemouth Corporation in 1954. 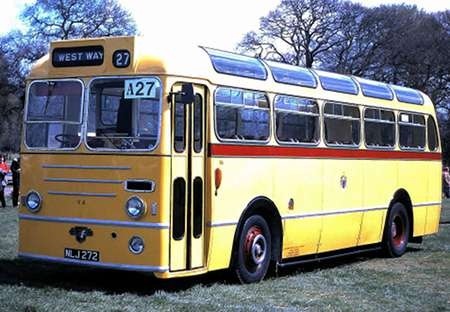 She is seen on Southampton Common, while taking part in the Southampton City Transport Centenary rally on 6 May 1979. That brings back many memories. These buses were regulars on our ‘school dinner run’ through Winton, in the early 1960s, between two schools. 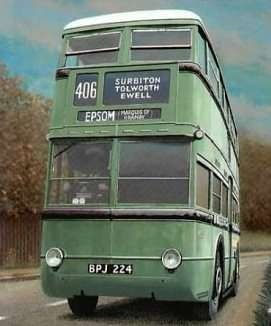 They were a brighter bus than the Park Royal bodied ‘RRU’ versions, but they could be rather warm on hot sunny days, in slow-moving traffic, as the rooflights had no means of shading. RRU 901 was originally Bournemouth 264 – a Leyland Tiger Cub PSUC1/1 with Park Royal B42F body. It started life in Bournemouth 96 with an open rear entrance and front exit with doors in 1955. It was rebodied around 1957 for One Man Operation. It lasted until 1971 when it was sold to Burton on Trent (Maroon and Cream) and then transferred to East Staffs when Burton disappeared. It went into preservation in 1977 and went back to Bournemouth colours. It has had a bit of a chequered life in preservation and was in a sorry state in the early 2000’s. Around 2008/9 it moved to Scotland where it was extensively re-panelled and repainted in a Western Scottish style livery, which is the way it is currently. It had an overheating problem at Kirkby Stephen this year, but was in service on the Saturday, and since then the water pump has been removed and found to have been well and truly bodged by someone previously with a metal pin and black silicone mastic. It is seen in resting between duties at Kirkby Stephen West. That livery wouldn’t look amiss in Southport! 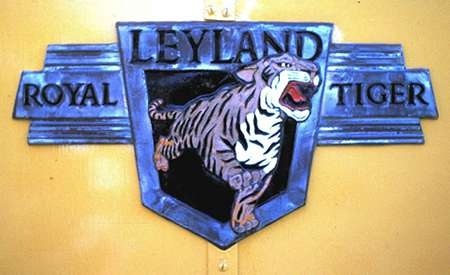 Compare this to Stockport’s Tiger Cubs, built by Crossley to the same basic design. Some have said the Stockport version has more than a passing resemblance to the RF and the Monocoach. 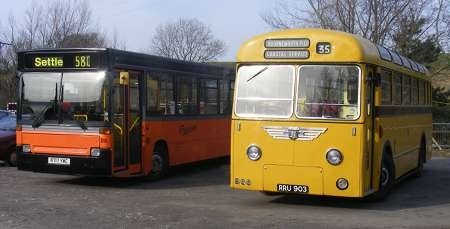 A sister vehicle, RRU 903 is preserved in Yorkshire in Bournemouth Corporation livery. These photos show it in Grassington (in company with a much newer preserved bus, Pennine Dennis Dart R717 YWC) and a rear view at the farm near Skipton where the vehicle is kept. The rear end is very unusual, with the emergency door on the offside. I had the privilege of driving this bus a few months ago. It was the first crash gearbox bus I had driven for many years, and it was a great relief to feel the gears engaging without a "crunching" sound. Did this bus (and the rest of the batch) originally have a rear door in addition to the front? This was the normal Bournemouth fashion for many years. Although now clearly removed, it might explain the unusual rear design for the emergency door. 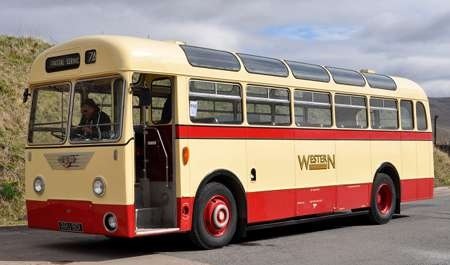 A study of the Western SMT liveried bus reveals a similar layout at the rear. Bournemouth did convert it’s dual entrance Tiger Cubs to front entrance as early as 1957 and did the same with the 1951 Royal Tigers later on. The unusual rear arrangements probably result from that change. 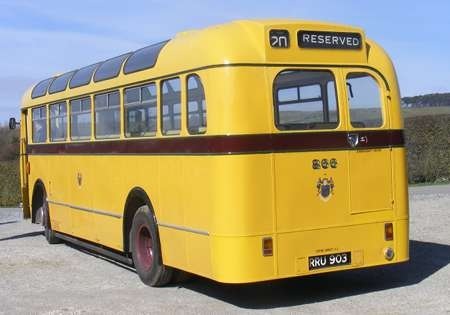 For comparative purposes here is a view of a Crossley bodied Stockport Tiger Cub on Park Royal design frames dating from 1958. This batch of buses all had a rear open platform entrance, rather than a second door. 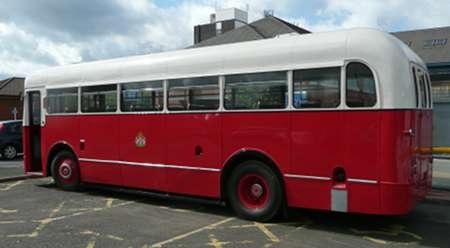 The buses didn’t last long in this configuration before being rebodied, hence the "two" windows on the nearside as opposed to the one on the offside. On mine you can still see some of the framework for the steps underneath. This original set up would certainly explain why the emergency door is on the offside. I am still puzzled about access to that rear corner emergency exit. How would passengers get to use it in an emergency? Is the rear seat moved forward to creat a gap behind it, or is the rear nearside seat a ‘three seater’ with a space on the offside? It’s all rather unusual, but an expert with knoweldge of the interior layout will hopefully be able to resolve this puzzle.